If you’re like me and have really sensitive skin, you’re basically stuck with shaving your legs all the time. Waxing is out so I’m always trying different razors to see what works best. 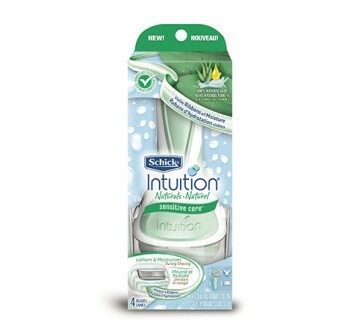 Schick’s Intuition razors aren’t new to me but the Sensitive Care was. It has a really nice, light scent and the built in solid is a really convenient way to shave without dealing with a cream as well or a moisturizer afterwards. It’s also great for travelling. My only issue is that the shave bar disappears really quickly and it’s hard to properly clean out the blades because the bar is in the way. This means you have to get refills more often than you would a traditional razor. If you need something to take with you on a trip or camping, this is definitely a great idea. Even if you’re just touching up stubble. But this is not the razor for a big after winter shave. If you need something that won’t irritate sensitive skin though, this is definitely a way to get super smooth skin.